Remember the yarn we found amongst my mothers stash that moved into my stash? 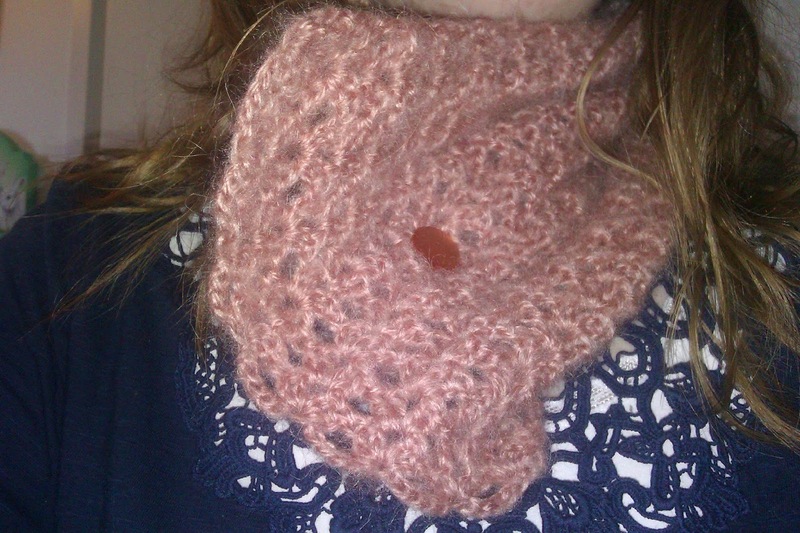 Well I didn't dally long and I made a small scarf/cowl/thing. I used this pattern, but since I only had about 50 g of yarn mine didn't turn out quite long enough to fold around the neck. So I added a button from my stash and now it is usable. The colour is somewhat more like the first picture than the others but I just wanted to show you how sunny and spring-y things look around here these days. 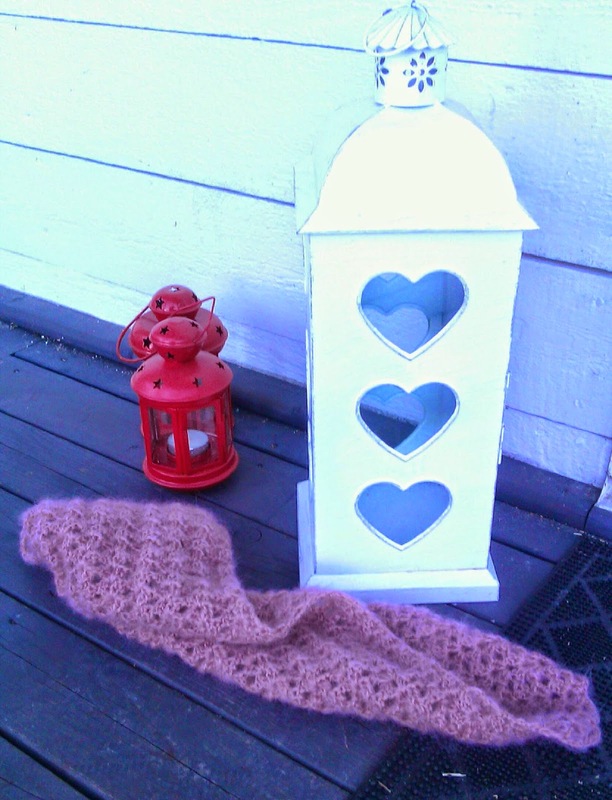 The colour is something usually referred to as "gammel rosa" in Norwegian which would translate into old pink I think. 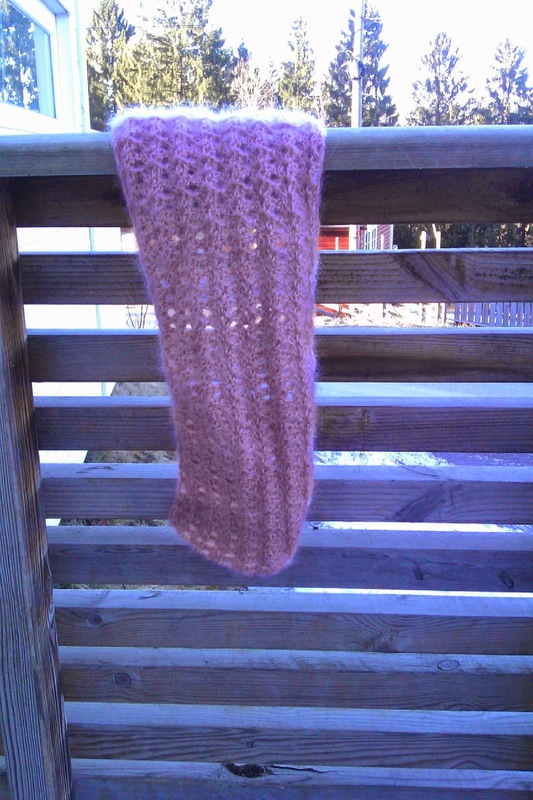 The scarf is made of a long since discontinued yarn from Chanterleine called Sissi and is made of a mohair acrylic blend, so it fits nicely in spring., as it is not too warm. Or maybe in autumn as the pink seems more like an autumn pink than a spring pink to me.... I think maybe mum bought it when visiting my aunt since there was a store called Domus there and that is where this yarn was bought... But it does come all the way from Paris. Anyway, I quite like it and I finished it in a day, or rather a night, I got so engrossed in wanting to see how long it would turn out with only 50 g of yarn. Which was 60 cm I might add and 55 rows. I liked the pattern and am now going to make another in the Sandnes Kitten Mohair yarn I bought at mums last week, and since I have 100 g I think this one will actually turn into a proper scarf. Although that means I have to buy more Mohair yarn to make the "englemaske" shawl I wanted to make, but that is ok, if I use two or more yarns I can buy one new and at this rate that might happen sooner than you'd think. Also I think these scarfs would make excellent gifts and they are easy enough to make while watching TV but decorative enough that people will actually wear them;) I hope. And buying yarn for presents is always allowed no matter how big your stash is. I have to go, I have a bunny nipping at my ankle to get my attention. It is cuddletime.